Our very own Aileen Sloan has now gained a DIPLOMA (with distinction!!!) in Professional Non-surgical Aesthetic Practice on top of her 10 years qualified experience in Facial Aesthetics. Now you can be treated for wrinkle softening & facial rejuvenation by one of the 1st people in the UK to gain a DIPLOMA in this field. 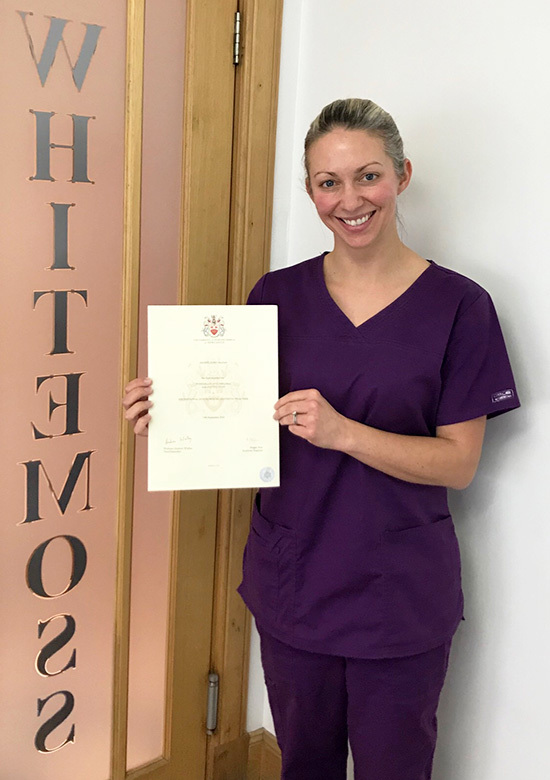 Here is Aileen with her certificate after 2 years of study! Contact Whitemoss Dental Practice for a FREE consultation. 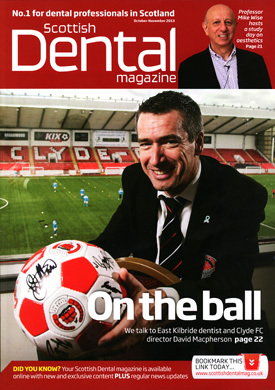 David's dedication to dentistry (and to Clyde FC!) is highlighted in a recent article in Scottish Dental News. This major interview charts David's successful career to date - and his dreams for the future, underlining the magazine's headline "...not your average dentist!" "I always had this deep ambition to do the best I could in whatever I did. And that's what we did here at Whitemoss. We Decided to change the rules,..."